Sophomore Shelby Stewart opened the scoring just 2.5 minutes in controlling a pass from junior Jennifer Smith and drilling it home underneath the cross bar. The Governors were able to control the onslaught on Tennessee Tech attack with sophomore Mary Parker Powell pulling in four first-half saves and stifling the Tech offense by coming off her line to gather balls played inside the 18-yar box. Tennessee Tech found a hole in the Govs young back line in the 32nd minute, when an unmarked forward received a pass inside the box and got a shot off beating Powell to the lower left corner to tie the game 1-1. Towards the end of the first-half the match began to open up as both teams played end-to-end chasing the go-ahead goal. The Golden Eagles again found the back of the net in the 38th minute as a TTU forward spun around a Governors defender and beat the keeper to the outside post. 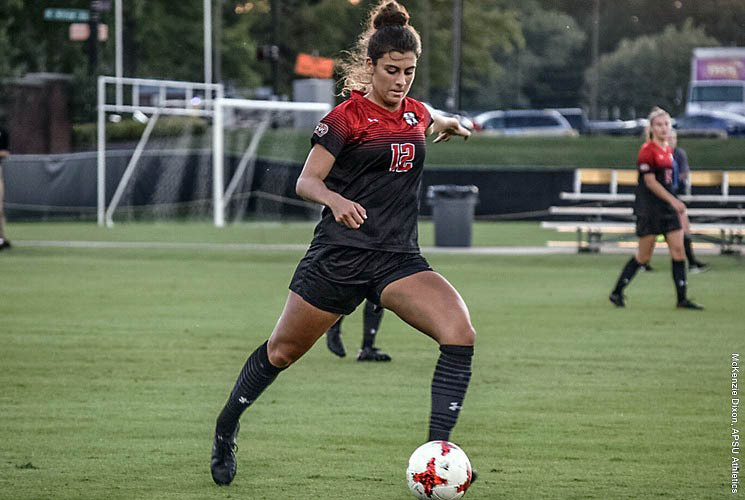 Tennessee Tech looked to drop lofted balls in over the top of the Govs back line, but sophomore defender Renee Semaan stood strong heading away the Golden Eagles repetitive attempts to feed their attackers. Semaan and the Govs defense kept the score close heading into halftimes. Despite going down late in the first, the Governors came out fighting in the second half controlling possession and building offensive pressure from the back. The Governors forced the Golden Eagle keeper to make two saves in the second-half and earned two late corner kicks as they tried to find an equalizer, but could not find the back of the net before time expired. The Govs offense continues to produce, as they push their goal scored streak to 13 games. Austin Peay has yet to be shutout thus far in 2017. Stewart scored her third goal of the season and is now tied for second on the team in goals with freshmen Morgan Drawdy and Claire Larose. Powell pulled in four saves bringing her season total to 24 in 11 starts. Jennifer Smith had her first assist of the season, to go along with a penalty kick scored against SIUE (9/22). Defensive Duo: goalkeeper Powell and centerback Semaan are the only two Governors to play all 180 minutes this weekend. The Govs will return to Morgan Brothers Soccer Field protecting their six-game home unbeaten streak 7:00pm, Friday against Southeast Missouri.